Farming runoff turns the sea floor into a wet desert and forces species onward or upward. The seas off the Gulf of Mexico look much like any stretch of ocean — an expanse of mercurial waves shimmering and sparkling in sunlight — except for the greenish tint. Below the surface, it’s a vastly different story owing to a problem that’s suffocating the sea. For marine ecologists like Nancy Rabalais, diving here is like entering an upside-down world where the water column has been turned on its head. The barnacles and sponges usually found on the seabed now cling to oil rig platforms where Atlantic spadefish, triggerfish, snapper and larger pelagic predatory fish hide and hunt. "There’s a complete fish foodweb in the upper water column," says Rabalais, the executive director of the Louisiana Universities Marine Consortium, who has spent much of her life trying to deepen our understanding of dead zones, the cause of this problem and what can be done to reverse it. 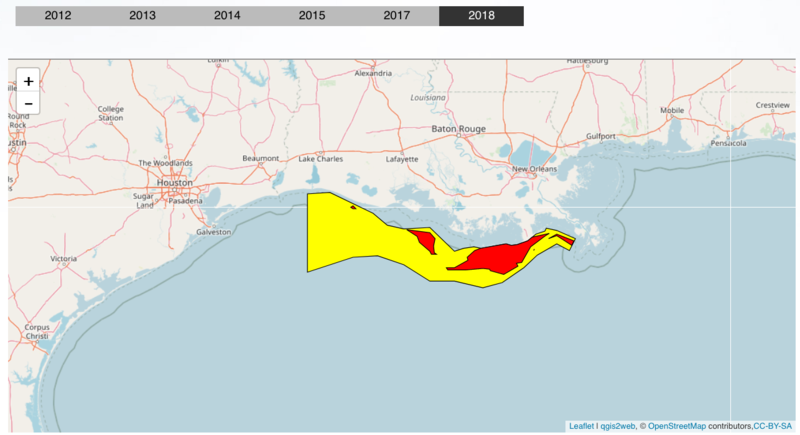 The hypoxic zone, or "dead zone," in the Gulf of Mexico occurs in the summertime when the concentration of dissolved oxygen in the water becomes too low to support marine life. As a result, the seafloor that once housed snails, worms, starfish and bivalves has morphed into a wet, lifeless desert. The more mobile species, like fish, shrimp and crabs, move onward or upward. "The major player is the Mississippi River," continues Rabalais. 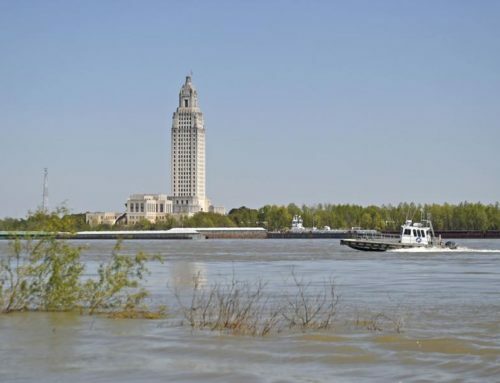 "It delivers a lot of freshwater discharge and dissolved nitrogen, phosphorous and silica from fertilizers into the water column, and those are carried into the river delta and flow west." This warmer, less dense freshwater floats above the denser, saltier Gulf water, causing it to layer, or stratify. The nitrogen, phosphorous and silica on the surface get "consumed" by phytoplankton, whose growth is controlled to some extent by the availability of these nutrients. So, when an excessive amount pours into the sea, it sparks a phytoplankton feeding frenzy, which blossoms into a dense blanket of floating algae — hence the greenish tint. When the algae sinks into the cooler waters below, bacteria clock in and begin breaking it down. More oxygen is used than made, causing the water column to become oxygen deficient from the middle downward. And the water’s layering prevents the oxygen-rich waters above from mixing with oxygen-poor waters below. Simply: No gulp of fresh air for the Gulf. 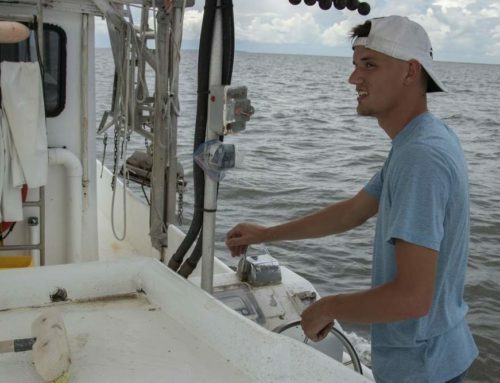 [The Gulf Coast dead zone] is larger than it was when we started our research in 1985," says Rabalais, who adds that other researchers disagree on this point since they calculate it differently. 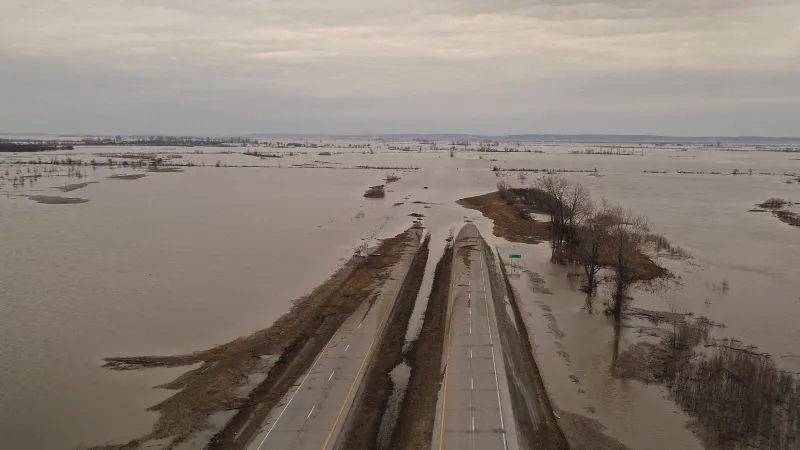 "We see a clear increase over time, especially following the 1993 flood of the Mississippi River." 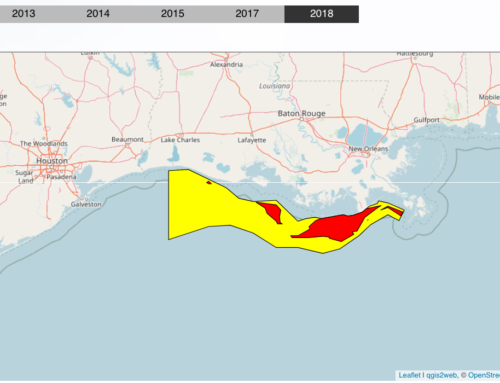 The average size of the dead zone over the past five years has been about 5,500 square miles, and about three times higher than EPA targets. 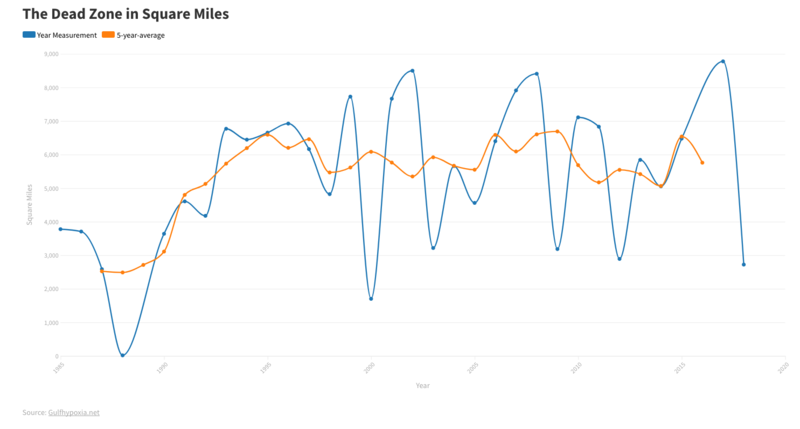 This year’s dead zone spanned 6,474 square miles — an area about the size of Connecticut and Rhode Island combined — thanks to heavy June rains and high amounts of nutrient runoff in July. The last time it exceeded this amount was 2002. 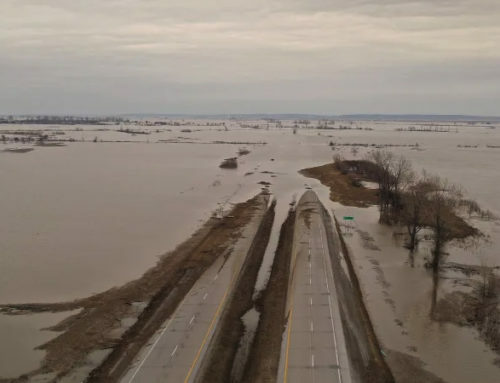 According to scientists, non-sustainable agricultural practices are the main contributor — heavy fertilizer use and poor land management practices have increased erosion and runoff, which drains more nutrients from the Mississippi watershed. "It’s primarily from row crops of corn grown for livestock feed and ethanol plants," says Rabalais. "Human diet has a lot to do with it, the more chicken, pork, etc. people eat, the more fertilizer needed." 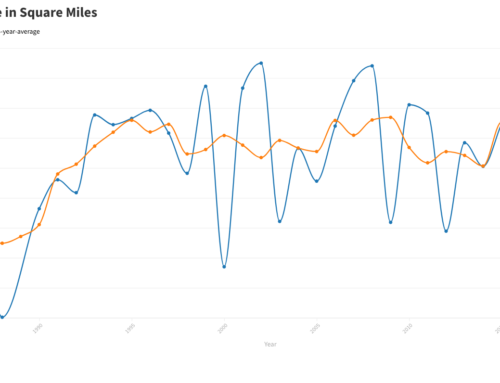 The concentration of nitrogen in the river has tripled since the 1950s. Phosphorus concentrations have doubled since the 1970s, though silica use has halved. And with water from 31 states draining into the Mississippi, the Gulf of Mexico is bound to be a predictor of the river’s health. "It’s a people and cultural issue that’s not easily solved," says Rabalais. "Policy and education are going to make a difference. 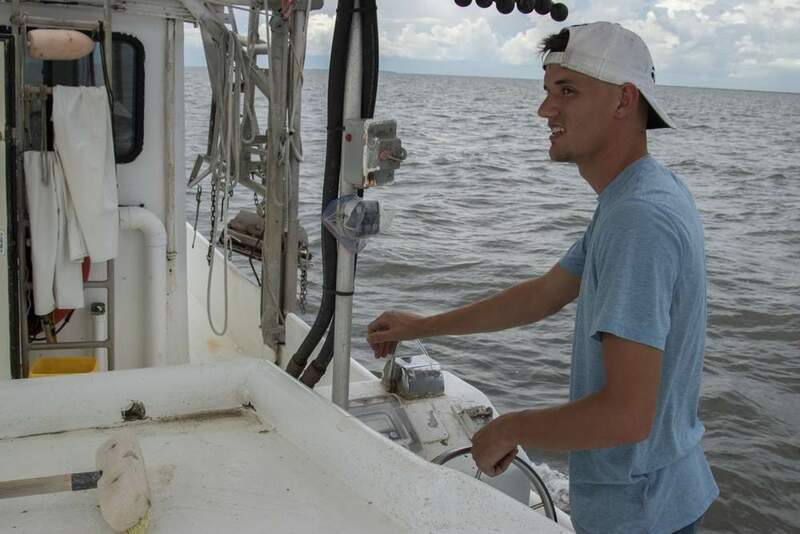 But, it’s not just the Gulf of Mexico, but the whole watershed that’s having problems." A few ways to begin turning the tide on dead zones would be to reduce the amount of nutrients entering the river, create buffer strips next to streams, and allow the river to flood into flood plains. These types of changes could, however, increase the cost of growing food, among other things. "If agriculture were to reduce the nutrients in a substantial way, there will be a reduction in the size of hypoxia," emailed Rabalais, providing the example of how the Black Sea’s large hypoxic zone began to recover after the amount of phosphorous and nitrogen entering the Danube River was decreased by 50 percent. Even then, says Rabalais, "The foodweb has not completely rebounded."